Background: Beta vulgaris (family: Chenopodiaceae) is now widely is used more in the food industry as a rich source of sugar but it is less considered in medicine. Beet has been used in traditional medicine for hundreds of years to treat a variety of diseases such as constipation, decreased libido, gut and joint pain and dandruff. Methods: This study introduced the benefits of Beta vulgaris by reviewing Iranian traditional documents from the 10th century until now and also compared modern phytotherapy of plant beet from the electronic data banks such as ISI, Pub Med and Scopus with findings that extracted from traditional literature. Results: This plant is known in Iranian Traditional Medicine (ITM) as Selgh (Arabic) or Choghondar (Farsi) and its leaves are used to develop treatments. Results confirmed that the plant referred to as Selgh in traditional books is that the plant Beta vulgaris in contemporary studies. Treatments that have not been evaluated in modern phytotherapy but do appear in traditional treatments include fever, as well as psychological and psychiatric issues. 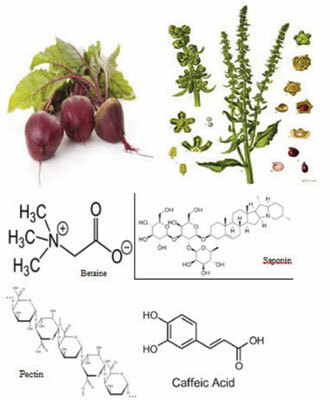 This article tells the history of beet in ITM and can confirm use of plant Beta vulgaris in medicinal practice. The report can be applied for certification of plant Beta vulgaris for researchers and experts. Conclusion: The findings of this study can help the researchers in producing therapeutic products and new application. Plant Beta vulgaris, Iranian traditional medicine, phytochemistry, pharmacology, chenopodiaceae, plant.